This is the first game in the Street Fighter series. For other games in the series see the Street Fighter category. 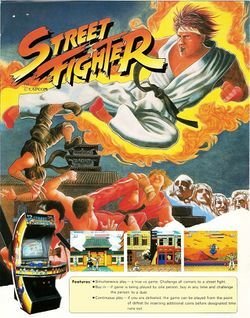 Street Fighter (ストリートファイター Sutorîto Faitâ) is a 1987 arcade game developed by Capcom. It is the first competitive fighting game produced by the company and the inaugural game in the Street Fighter series. While it did not achieve the same popularity as its sequels (particularly Street Fighter II) when it was first released, the original Street Fighter introduced some of the conventions made standard in later games, such as six attack buttons (only found on some versions of the game) and special command based techniques. Two different arcade cabinets were sold for the game: a "Regular" version that featured the same six button configuration later used in Street Fighter II and a "Deluxe" cabinet that featured two pressure-sensitive rubber pads. The pressure-sensitive pads determine the strength and speed of the player's attacks based on how hard they were pressed. The game features a cast of twelve fighters: two playable characters and ten CPU-controlled opponents. Unlike the subsequent Street Fighter games, the player cannot choose their own character. Instead, the first player is assigned to play as Ryu, while a second player can play as Ken. Two players can also compete in competitive matches. The player can perform all three of Ryu and Ken's signature special moves. This was the first game to ever use such a concept. Unlike the subsequent Street Fighter sequels and other later fighting games, the specific commands for these special moves are not given in the arcade game's instruction card, which instead encouraged the player to discover these techniques on their own. In the American and Worldwide versions of the game, Ryu's and Ken's voices were dubbed so that they yelled the names of their moves in English (i.e. : Psycho Fire, Dragon Punch, Hurricane Kick). Subsequent localized releases left the Japanese voices intact. A port for the PC Engine/TurboGrafx CD was released under the title Fighting Street (ファイティング・ストリート, Faitingu Sutorīto?) in 1988. This same version was later re-released for the Wii's Virtual Console in North Americ] on November 2, 2009, and in the PAL region on November 5, 2009. An emulation of the original arcade version is featured in Capcom Arcade Hits Volume 1 (along with Street Fighter II Champion Edition) for Windows, Capcom Classics Collection Remixed for the PlayStation Portable and Capcom Classics Collection Vol. 2 (along with Super Street Fighter II Turbo) for the PlayStation 2 and Xbox. This page was last edited on 14 August 2016, at 03:07. This page has been accessed 50,394 times.